If you ask me about the customizability of the new Ribbon UI in Office 2007, my answer would be: too little, too difficult. Compared to previous Office versions, especially Office 2003, 2007 simply has a serious customization deficiency. In fact, most users will probably conclude that the Ribbon cannot be customized at all. In contrast, Office 2003 is the most customizable Office ever. You can locate your menus and toolbars anywhere you want on the screen, create your own menus and toolbars, change icons and labels, modify toolbars and menus, and so on. There is almost no limit as to what components of the UI a user can alter. 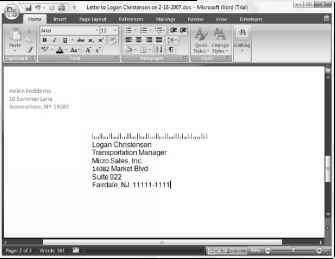 Customizing Office 2003 is also easy to do, as alteration can be achieved with a few mouse clicks. The Ribbon UI of Office 2007 though is a completely different story. Static with very limited customizability is probably the description most users would give this new UI. Most users probably only discover the Quick Access Toolbar (QAT) and then conclude that this must be it. Is that really all there is? How did we end up with such a lack of customization? Microsoft had to create the Ribbon UI completely from scratch. If you have read through some of the Office UI Bible, you can get an idea of the huge amount of resources that went into creating this new UI. However, even at Microsoft resources are limited. Therefore, the need for every feature of the new UI had to be justified. Real customizability was unfortunately a feature that didn't make the cut. As the Office UI Bible explains, the UI team could not make the case for customizability, if only ~1.9% of the Office 2003 sessions of roughly one hundred million users were with customization. The case is even weaker, as 85% of those customizations involve four or fewer buttons. Therefore, Microsoft decided to support the case encountered by 99.7% of all users: no customization or four or fewer buttons. That left the remaining 0.3% in the rain. Those 0.3% represent around 1.35 million people, as there are 450 million paid Office customers, and are also the ones who are most likely to participate in the Office development process, e.g., through participation in the beta. My opinion about this approach can be found in my designing with statistics post. In addition to this argument, a highly customizable UI unfortunately presents a massive support issue. You can see this, if you try to remember how many times you accidentally moved a menu or toolbar in Office 2003, or customized it otherwise by accident. You probably know how to undo your accident, but many, many users do not. Microsoft decided that in order to make those 99.7% of all users happy, one toolbar was enough. In order to prevent accidental customization and make sure users always have that toolbar accessible, it became non-floatable. Born therefore was the Quick Access Toolbar. That is not the end of the customization story though. There is also one Ribbon tab that you can hide or show, namely the Developer tab. You can also customize the status bar fully. Toolbars and menus created in a previous Office version and by legacy (meaning non-Office 2007) add-ins can also be used, but not created, in 2007. Last, but not least, galleries can be customized. Some "customize" themselves automatically, e.g. the recent document list or the shapes gallery. Others can be manually customized, especially in Word. For example, the galleries for page numbers, headers and footers can be customized by the user. But that's it. Seriously, that is it. Everything else, especially the vast majority of the Ribbon, is static and cannot be customized. Therefore, describing Office 2007 as having a "customization deficiency" or complaining about the lack of customization in it, reflects appropriately the state of affairs in 2007. 1. Write XML code to define the Ribbon customizations. 2. Create a table in the Access database to store the Ribbon names and their XML code. 3. (Optional) Write VBA callback procedures to run from custom Ribbon command buttons. 4. Close the database, then reopen it, to load the Ribbon(s) from the table. 5. Select the Ribbon to load into the database. 6. Close and reopen the database to load the Ribbon. In addition to creating the XML code, VBA code (if needed), and table, you also have to close and reopen the database twice to get the Ribbon customizations to appear — once to load the Ribbon, and again after selecting the Ribbon to use in the database. The next few sections guide you through customizing the Ribbon in an Access database. : T'P T" T ^The sample database for this section is Test Ribbon.accdb.